Clicking (1) on one of the devices in the left window enables the buttons in section ‘Device’. 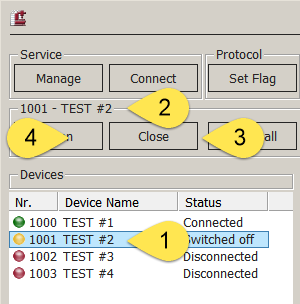 Instead of ‘Device’ the number and name of the selected device is shows as section title (2). Clicking on ‘Close’ (3) manually closes the device connection, the icon color changes to yellow, the status changes to ‘Switched Off’. In this state no attempts are made to receive data from this device.